I have had no issues with the boat, bilge has been bone dry until this spring. I put the boat in the water, and after a day there was several inches of water in the bilge. Took the boat out and found the pictured hole in the hull, indicating corrosion arising from inside the hull. We drained the bilge, tapped the hole and put a stainless bolt in, and fished for several days without incident. I brought the boat to an aluminum boat builder in northern Mass for inspection and repair. We jacked the bow up high, and a gallon or so of salt water drained from the bilge, from the bow section, as the stern was dry. The hole was drilled out and the surrounding metal was sound full thickness. The hull was inspected externally and was felt to be in excellent shape outside of the hole pictured. There was 3 areas of pitting inside the stern which was felt not to be an immediate problem. There were no other areas of any concern. The hull was patched with 3/16" aluminum, as pictured. We concluded that the corrosion may have occurred due to standing water in the bow. I rinsed interior of the hull with salt away as best I could, dried and sprayed Corrosion X on the interior of the stern section. I keep deck hatches open for ventilation when weather allows and the interior appears nice and dry. Plan moving forward is to store the boat with the bow jacked high enough to drain bow section and keep an eye on things. 3. Should I install an inspection hatch in the bow deck? if so, does anyone with knowledge about Pacific construction have recommendations as to where to put the hatch? 4. I plan to install a bilge pump. Any advice or pitfalls to be avoided here? 5. Should I be concerned about internal foam being wet? IMO standing water alone won't cause that problem however if a non-aluminum chunk of metal (like a stainless screw for instance) was resting at that point inside the hull and immersed in salt water over a long period of time then an active galvanic corrosion cell was created at that point that caused acute and highly localized damage. In such a case your hull anode, even if it was the more correct aluminum type, wouldn't protect the hull if the boat primarily sits high and dry on the trailer. Hull anodes will only protect against galvanic corrosion when they (and the boat) are sitting in water. Two recommendations, First, somehow get a visual on the inside of the hull at the point of corrosion to see what suspicious object might be laying in there that is eating through your hull plating. A mechanic's inspection camera for instance. 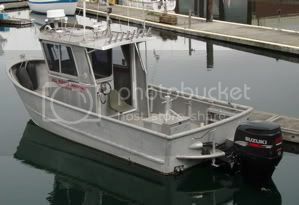 Secondly, (and unrelated to the first suggestion) replace the hull and engine anodes with aluminum units. Zinc anodes have no place on an aluminum boat, they are not reactive enough to protect the hull or the engine. Aluminum anodes are alloyed with other trace elements that cause them to sacrifice themselves more readily when there is a galvanic load that could cause hull pitting or engine corrosion. If your engine anode is aluminum and your hull anode is zinc the engine anode will attempt to protect the entire boat while the hull anode sits there and does nothing (such as yours is showing in the pic). If neither hull or engine anode is aluminum then your engine castings and fasteners will start to freeze together and you will be breaking bolts when attempting to work on the lower unit. On second look at your photo of the hole and your comments regarding electrical issues on the boat there is the possibility that the hole could be the result of stray current corrosion and not the galvanic foreign object suggestion I described above. If there is a weak DC+ short to the hull in the console somewhere (bad wiring for instance) that current will seek out an earth ground opportunity which typically will emanate from an outside point on the hull close to where the short is while the boat is sitting in salt water. The damage at such a point can occur pretty quickly. That weak DC+ short would also explain your battery issue. Hull anodes will not typically protect the boat from stray current corrosion unless the current leakage is in close proximity to where the anodes are mounted. Thanks Chaps I am going to have to figure out a way to get a look from above... We put a scope inside through the hole but could not really see anything, so who knows. I was concerned a bit that the electrical issue might indicate some sort of stray current that could be causing internal corrosion, but I guess you'd expect a more diffuse problem which at least for now does not appear to be the case? Anyway it looks like there is a plug in the foredeck painted over that I might be able to get into for a look, or cut a new hatch. Chaps: would the hull be protected from stray current when the battery switch is in the off position, and boat out of water? Typically yes, even with the battery on it wouldn't make a difference if the boat was out of the water. If it is in the water (and the battery is on) stray current damage can occur in a tight area and very rapidly, shortest path to earth ground using the salt water as a pathway is the likely spot. Is there a metal pile or dock hardware in the water near your boat? when in the water it is tied to a wooden raft at the end of the dock. The corrosion did occur on the side of the boat that faces the dock... I will take a close look, but other than bolts used to construct piers severe feet away no metal around... I always turn batteries off when not running I guess I am glad I did. This is a bit of a wake up call thanks for the insights. generally a single point of corrosion can be assigned to some form of stray current, poor wiring, hull used as an anode. But as Chaps has mentioned several times; if you can't find a way to inspect the interior of the bilge- you can't determine if you have a single point of corrosion/excavation OR if this is just the most advanced point- and has corroded through?- while others exist but just aren't as advanced? IMO; its critical to get a view inside the bilge at the hull's inner surface. Otherwise you can't decide if there is a single point (electrically induced) of damage or if the the damage is widespread? If you'll look up Jetty Wolf's posts and pics of the various damage his hull suffered (?) you'll see the need to inspect inside the bilge area. Since color video bore scopes are so inexpensive and repairing a welded aluminum boat is so expensive.... it seems to me that ANY effort needed to inspect the bilge of a sealed deck hull is well worth the costs to get in there and "KNOW" what's going on? There are many potential (no pun) causes of aluminum boat corrosion(s) and diagnosing them requires clear knowledge of the actual symptons of your boats' problem. As near as I can tell from reading the thread- you may not be aware if this point of corrosion is just the first to 'burn through' ??? OR if its a single point that may have been the result of some specific and isolated cause? Just making a post to insure you treat the inspection with the priority it deserves: if you don't know why (can't deduce or imply from full knowledge the cause) this happened? - you cannot be confident there aren't greater problems inside that await you? There are lots of threads here- exploring this "type" of problem, many don't have conclusive results. But there are other causes not explored on this thread that may be course of inquiry that would serve you well- so reading the archives is my first recommendation. Next is to get a view inside. Kevin: thanks for your insights I will get a better look inside the hull. What I am thinking is to cut an inspection hatch into the forward hull and get as complete an inspection as possible of the area of corrosion and the hull interior. I am not entirely clear on the Pacific construction but I think because of the use of foam I will not be able to look at the entire hull. I guess I would assume that if what I can see looks ok the rest is probably OK? Jetty's experience with the gas tank is scary too. As far as I can tell, my tank looks ok but there is really no way to inspect it fully without taking the deck apart.... And I will assess for stray current and correct what I can. I did use a scope to inspect the hull through the available hatches but really could not see much.